I'm between jobs and, as a result, no longer want Google Now to keep telling me when I should leave for work, how long it will take me to travel there and that I'm running late. 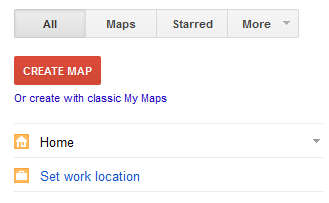 I can remove my work location from Google Maps by logging into it on my desktop PC and selecting Settings → My Places. However when I start Google Now and then select Magic Wand → Places it still shows me a location for my work. I can select it and erase the address, but I am unable to get it to accept nothing as a location. Is there any way I can tell Google Now that I no longer have a work location? Clearing the Google Search app data and cache but my incorrect work setting still remains. Telling it that I no longer wanted to be notified about getting to work but it applied that setting to all my calendar appointments and I stopped getting any notifications for anything in my diary. Setting my work location to the same as my home. I still get notifications for going to work, except that they now happen at 9am and tell me that it'll take me 0 minutes to get there. Launching Google Maps on my phone, pressing the user icon (next to the directions button to the right of the search field), tapping and holding Work, clearing the field and submitting it. Although Google Maps now says Enter work address (implying that the field is empty) this change isn't reflected in Google Now as it still shows my work address. [update] Although the steps appear to work, less than 24 hours later Google Now will automatically re-add your work address - even though you've not got it listed in Google Maps. 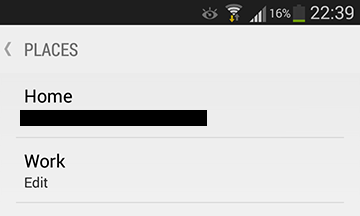 Tap "Settings" and then turn Google Now to "Off." A confirmation box appears. Check the button that says "Also turn off Location History." At the next screen, click "Turn On"
Your "home" address should show as your current GPS location. Scroll down until you see a "magic wand" symbol in the lower right corner and tap it. Your Home address should appear (you can tap to edit this if not correct) and "Work" should be empty. Not the answer you're looking for? Browse other questions tagged google-maps google-now or ask your own question. 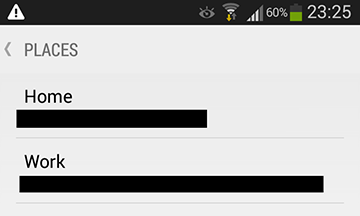 How do I enable Google Now on my Galaxy Note 2 (NT-7100)? How Do I Turn Off Google Now Card Notifications? Why doesn't Google Now's place-specific reminders remember my home location?